Minnesota's public hospitals and clinics are stuck with a large and growing bill for uncompensated care. It's the unpaid bill they're left holding when they treat the state's 272,000 uninsured residents. Most of the bill is paid by local taxpayers and other patients with health insurance. Hospital officials say Gov. Tim Pawlenty's budget proposal will cause uncompensated care costs to grow. The financial crunch, they predict, will cause them to restrict the care they give to poor people. Minneapolis, Minn. — The unpaid bill this year at Minnesota's largest public hospital, Hennepin County Medical Center in Minneapolis, is $24 million. Officials predict it will more than double in two years, due in part to health care spending measures proposed by the Pawlenty administration. Minnesota's public hospitals and clinics push a share of uncompensated care costs off onto local property taxpayers, and onto patients with health care coverage. But the costs are rising faster than they can be passed along. 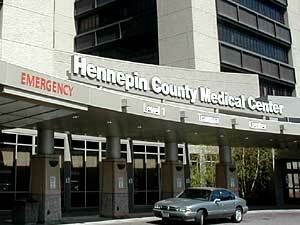 Hennepin County officials are asking state lawmakers for help in covering the costs. HCMC administrator Jeff Spartz says the hospital is also planning cost-cutting measures, including reducing hours at HCMC's clinics. He says cutting clinic hours means fewer people will get preventive health care. Federal law requires hospitals to treat anyone, including the uninsured, who has a medical emergency. Sometimes they discover the uninsured qualify for a government program, so the hospital is reimbursed. However, in many cases patients earn too much to qualify for welfare, but too little to afford health insurance. Some of them qualify for Minnesota's state medical insurance program. However, budget-balancing proposals before Minnesota lawmakers this session would make fewer of them eligible. The result is hospitals face a larger unpaid bill for the cost of their medical treatment. Tougher medical welfare eligibility standards are also causing uncompensated care costs to rise. The slow economy is also part of the problem. People are losing their jobs and their health coverage. More of them are using the emergency room as their health plan. Recently, a young man came to the HCMC emergency room, after being injured while coming home from a night on the town in Minneapolis. "(I) climbed up a fence to take the shortcut home, and the fence kind of gave out and I landed on my foot wrong -- and that's how I ended up here," he says. The 23-year-old doesn't want his real name used. He's sitting in a wheelchair in the emergency room, where doctors and nurses have taken care of his injured foot. However, there's another problem. He can't pay. He's a recent college graduate who's unemployed and has no health coverage. "Up until now I've usually been covered, but I have no medical insurance as of now, which is unfortunate," he said. The young man doesn't qualify for any medical welfare program. His mother, who also doesn't want her name used, brought him to the emergency room. She says she can't help her son pay the bill because she's out of work. "I have two boys, (my insurance) covered them when I was working for the state ... and I'm still looking for work myself," she says. The federal government estimates the national uncompensated care bill last year was $35 billion. Minnesota officials say the total in Minnesota has grown from $134 million in 1997 to $229 million in 2001. The two of them say they'll pay what they can, but don't think they have the money to pay his entire emergency room bill. The man says he delayed seeing a doctor for his foot injury hoping it would improve. In his case, the delay probably didn't add much if any cost to his treatment. HCMC emergency room doctor Steve Sterner says many patients without health insurance often delay treatment of serious conditions like heart disease or diabetes for weeks, months, even years. Delay in those cases, Sterner says, causes treatment costs to explode into hundreds of thousands of dollars when there's a crisis like a heart attack or a coma. "You wait, and you get sicker and sicker and sicker. Finally you do come in, and you are really sick and end up being admitted to the hospital -- spending a couple days in the ICU, maybe having a procedure you wouldn't have needed otherwise if your problem had been managed," Dr. Sterner said. Hennepin County Medical Center has the largest uncompensated care bill of Minnesota's 42 public hospitals. However, all are watching their unpaid bills rise. La Clinica on Lake, a south Minneapolis neighborhood clinic, sees 3,600 patients a year. Officials say three-quarters have no health insurance. La Clinica officials say limiting eligibility for state-funded health care programs means some of their patients will skip preventive health care visits. They'll end up using hospital emergency rooms as a last resort. La Clinica doctor Maria Veronica Svetaz says the outcome does not save money. "When you don't provide the basic care, or even when you don't provide care for certain diseases when they are in early stage, then you pay the consequences, moneywise. The patient will pay the consequences healthwise," Dr. Svetaz said. A worst case scenario, already played out in some areas of the country, is that rising uncompensated care costs will cause some hospitals and clinics to close their doors. A Hennepin County task force studying HCMC's financial squeeze may propose, among other ideas, levying a local sales tax. Eleven years ago, voters in Miami, Florida approved a half-penny sales tax to pay most of their public hospital's uncompensated care bill. Critics, including Dr. Nilda Soto, director of a Miami-area free clinic, says nearly all the money goes to one hospital. She says the money needs to be shared with neighborhood clinics which also treat poor people. "If you decide that you are going to fund something, you need to give this money to a group of people that are going to make sure these funds follows the people -- not that the people have to go and follow the funding," Dr. Sota said. Lyle Wray, former director of the Citizens League, a Minneapolis-based study group, says funding neighborhood clinics is an old idea that appears to help hold down rising uncompensated care costs. Wray starts a new job soon on the staff of Minnesota's health care cost containment task force. "A primary care clinic in your native language, with people that look like you and talk like you, is a really good investment rather than HCMC. Not to knock HCMC. We need to go back to basic stuff, and I think primary care with a drug benefit is a really good start," Wray said. If Gov. Pawlenty's budget proposal is adopted, state officials estimate that over the next four years, 63,000 people will lose eligibility for Minnesota's state supported health coverage. They will join the estimated 272,000 other state residents who have no medical health insurance.